Ideal for coloring books, scrapbooking, drawing, crafting andamp; doodling or anything else that allows you to show off your creative side like greeting cards, invites, decorating, nail art, tattoos andamp; more. 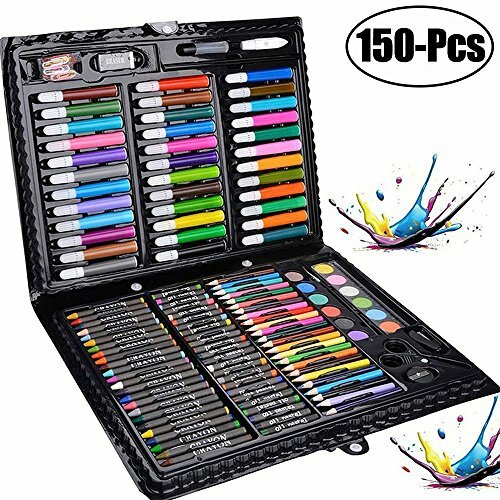 MULTIPURPOSE USE- 150-piece deluxe art set including art supplies for drawing, painting and our this comprehensive art set includes wet and dry mediums, all items are made of non-toxic environmentally friendly materials. WHAT ARE IN THE BOX-Our art sets includes 36pcs watercolor pens, 24pcs color pencils, 24pcs crayon, 24pcs oil pastels ,12 kinds of pigments, 20pcs clips,1pc ruler,1pc pencil,1pc sharpener 1pc eraser,1pc scissor,1pc paint brush,1pc palette, 1pc glue,1pc white glues,1pc stapler,which is really save your money. CONVENIENT DESIGN-Our this beautiful art set provides an artist with a wide range of materials in a compact, portable case, case is plastic with snap-shut handle organized and can carry easily ,it's suitable for using at home,school and travling. IMAGINATION and CREATIVITY- All pens in this art set have high quality pen point,the writing and painting are smooth ,and can color the picture easily ,a good painting tooling for children's imagination and creativity,you can paint with your children after dinner ,this is really a good accompany with your children . A PERFECT GIFT- A good birthday gift ,school gift for kids and children ,also ideal for anyone who loves painting and drawing as a hobby.